This is one of those classic parental games that's fun and educational. 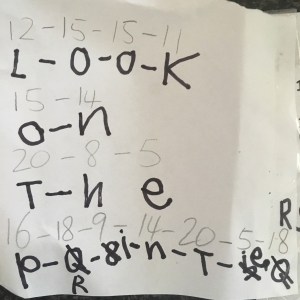 My youngest kidlet was home sick last week, and she happened to find a strange note that was composed of just numbers. Where did this note come from? What did it mean? It was most puzzling. She's only just learning to read, and getting her to do her reading writing tasks is pretty challenging. But she's read enough Billie B Brown Secret Mystery Club books to know that a note composed of just numbers is always the start of an exciting adventure. She went with the assumption that "A=1", drew up a translation chart, and she was away! When decoded the message told her to look on the printer. When she went to the printer there was a fresh note that required decoding. That one led her to under the stairs. And so on, all day long, she chased a linked-list of notes, and practiced de-referencing a pointer, like a good little program. The final clue told her to ask her mother for the next clue. Mum produced a clue, which when decoded, said "It's ice-cream time!" and everyone was happy with that. I was particularly pleased because I had no idea of how it should end, and sent it to mum as an easy exit. All up, I strongly recommend trying this kind of puzzle on your own kids, or any kids you find in the neighborhood. 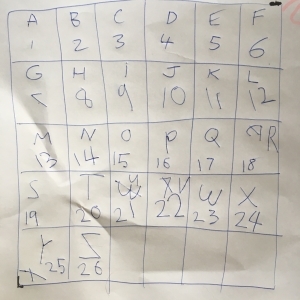 The simple "A=1" puzzle was good for a 6 year old, but you can progress to harder encryption techniques for older and more wizened children, or have the puzzles increase in difficulty as they go. My eldest would've lost interest if she'd been given the same material. A good "next step" would be a Caesar Cipher, where the "shift" amount is provided. A good step up from that is a Caesar Cipher where the shift amount is not given. That leads into the topic of frequency analysis (though other approaches will work fine too). A nice code to demonstrate is the 'pigpen cipher' (also known as the Freemason cipher), particularly because of it's cool alien-looking characters. My good buddy and aussie-bush-walker Dr Richard Mason says the EJ12 series of books have some great codes and puzzles aimed at kids (girls in particular). The "39 Clues" is another series I've heard of but haven't seen. Have you ever tried getting kids into code-making or code-breaking? What happened?